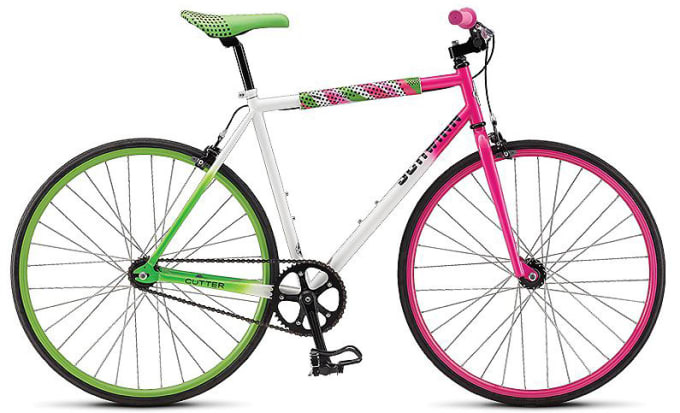 This psychedelic Schwinn N&apos; Gauged Hi-Ten Track frame is combined with a Cro-Mo steel fork and equally colorful rims, seat, handlebar covers, and top tube cover. The high-flange track hubs and doublewall rims give this extra hipster cred. At this price, you can definitely afford the powdercoat job if it&apos;s too much of a statement-maker.